Posted	 March 6, 2017 by	Sikh Dharma International & filed under 10-Guru Gobind Singh, Around the World, Events, Gurpurbs. 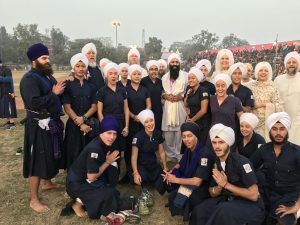 The Raj Khalsa Yatra, organized by Sikh Dharma International, was an amazing journey to India where we were blessed to visit the sacred Golden Temple in Amritsar and join in the celebration of Guru Gobind Singh Ji’s 350th birth anniversary in Patna Sahib. It was a wonderful opportunity for each participant to have a deep experience of their soul, to merge into the vibration of the Gurus, to hear divine Kirtan and take a sip and dip in the holy nectar tank, and to join with hundreds of thousands of devotees in praising God’s Name. 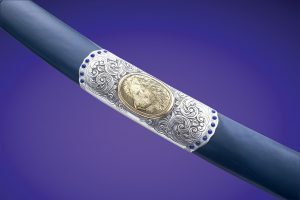 The Yatra was held from December 29th to January 8th. Our group of approximately 100 members came from all around the world. 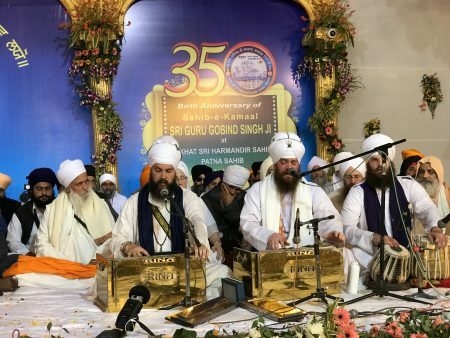 We represented the legacy of the Siri Singh Sahib, our spiritual guide and teacher, whose inspiration brought us to the feet of the Guru and the path of Sikh Dharma. We began our journey together in Delhi, where we visited the Bangla Sahib Gurdwara and our group was honored by the Gurdwara management there. 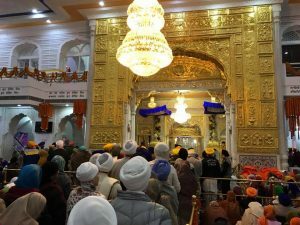 We left for Amritsar on December 30th to celebrate the New Year at the Golden Temple. While there, we visited with the students at Miri Piri Academy, who would later join us as we traveled to Patna Sahib. On New Years Eve we gathered at the Golden Temple and Yatrees joined MPA students to dip in the nectar tank and meditate to welcome in the New Year. We visited the Goindwal Gurdwara on New Year’s Day where participants of the yatra were blessed to recite Japji Sahib on the sacred steps. Two members of our group stayed there overnight and one blessed soul, Har Simran Kaur, completed the recitation of Japji Sahib on all 84 steps! Traveling with us throughout the Yatra was the amazing Chardi Kala Jatha (Sada Sat Simran Singh, also an SDI Board Member and Jugat Guru Singh, also Principal of Miri Piri Academy and Guruprakash Singh, Director of Spiritual Life for Miri Piri Academy), who played beautiful Kirtan at the Gurdwaras throughout the Yatra. Also with our group were members of our Sikh Dharma leadership; Bhai Sahiba Bibiji Inderjit Kaur; Siri Sikdar Sahiba Sardarni Guru Amrit Kaur; MSS Kirtan Singh; President of the Siri Singh Sahib Corporation, SS Gurujodha Singh; and Chairperson of the International Khalsa Council, SS Dr. Harjot Kaur, among others. 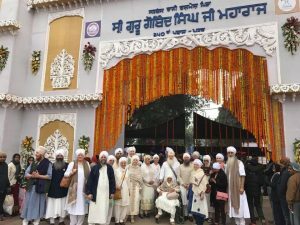 We left for Patna Sahib, joined by the senior class of Miri Piri Academy (MPA), on January 2nd to join the 350th Anniversary Celebration of Guru Gobind Singh Ji’s Birthday. Hundreds of thousands of Sikh devotees gathered for this auspicious and joyous event. 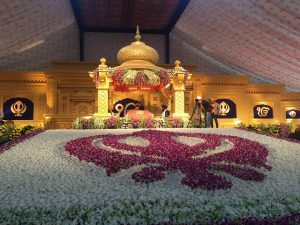 The 3-day celebration was held both in the elaborately constructed Gurdwara built for the occasion on the Gandhi Maidan fair grounds and the Takht Sri Patna Sahib Gurdwara. 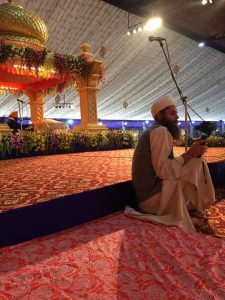 The days were filled with beautiful Kirtan, speeches, langars, a Gatka competition and a 10 kilometer Nagar Kirtan from the Gandhi Maidan to the Gurdwara. The MPA students participated in the Gatka competition and we were very proud that we were the only team that had females participating! The crowd went wild with “Bole So Nihal’s” when our girls showed their skill on the field! 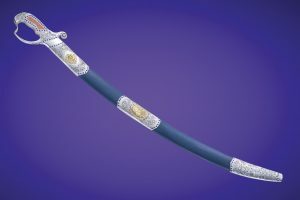 On January 5th, at the evening Gurdwara program honoring the Tenth Master, the Sikh Dharma International Sangat presented a magnificent jewel encrusted sword honoring the life and legacy of Guru Gobind Singh Ji to the Takht Sri Patna Sahib Gurdwara. 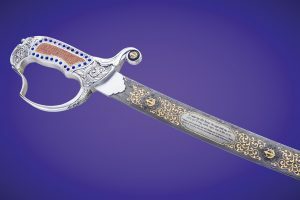 This “Sword of Raj Khalsa”, created by Master Sword Maker, Jot Singh Khalsa, on behalf of SIkh Dharma International, is a masterpiece featuring the poetry of Guru Gobind Singh inscribed on the Damascus steel blade. 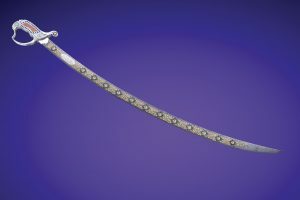 It was with great devotion and gratitude to the Guru that this sword was presented to serve as a manifestation of the love for the Guru from Sikh Dharma International. 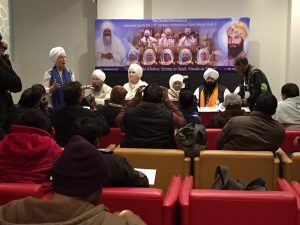 Throughout the Yatra we received a lot of press from the Indian media, and it was a blessing to represent the legacy of the Siri Singh Sahib and exemplify that Sikh Dharma is thriving in the West and in all parts of the world. We greatly appreciated the hospitality of the Bihar government in planning such a magnificent event and treating us with such kindness and respect. Special thanks to Gurumustuk Singh from Sikhnet, who accompanied us on the yatra and did a fabulous job streaming live video of the events. We heard from people around the world that they felt like they were there, because they were watching the video live, as the events were happening in real time. We returned to Delhi filled with inspiration and spirit, for our last days before returning home. It was a wonderful and transformative trip, that we will each cherish for the rest of our lives. Sikh Dharma International plans to organize more Yatra’s in the future and we hope you will join us for other inspiring and uplifting journeys to India. Agreed. Thank you for your comment. We’ve updated this. Sat Nam.